A political and community ‘Who’s Who’ turned out Monday night for the nomination meeting for the Quebec Liberal Party candidate for D’Arcy McGee riding where incumbent Member of the National Assembly David Birnbaum is seeking a second mandate. Flanked by Deputy Premier Dominique Anglade, Finance minister Carlos Leitao, English-speaking community relations minister Kathleen Weil and MNA Rita De Santes, Birnbaum was clearly beaming with pride on having served his constituents well over the past four years. Special guest speaker John Parisella, chief of staff to Premier Robert Bourassa and decades-long senior adviser to the QLP introduced Birnbaum as a man with great focus and an excellent representative for the riding. He noted, as I have on several occasions, Birnbaum’s eloquence in choosing the very best words in making his point. Said Birnbaum, in accepting the nomination and becoming the official QLP candidate, “We’re working hard in building Canada.” He pointed out how his government is not only looking inward at Quebec but seeking ways to strengthen the entire country, for example through bilateral work with other provinces. “It’s rewarding to contribute to the rest of the country,” the liberal member said. With regard to the work the QLP is doing for the local community and the Jewish community, he singled out the Jewish General Hospital and the government’s recent decision to fund “Phase 4” of the multi-million dollar redevelopment project. “The JGH is a model, as our health minister has said many times, and now has funding for the next step of its major expansion,” Birnbaum said. “I’m doing my piece to move the Cavendish dossier forward,” Birnbaum announced, citing his many meetings with municipal and provincial leaders. “In 2024 you’re going to see something happen,” he stated. “I presented a resolution by Cllr. Ruth Kovac concerning safety on signs,” Birnbaum mentioned. In fact, Cllr. Ruth Kovac and Harold Staviss have been remarkable in their consistent advocacy for bilingualism in the retail and commercial arena. It was yours truly that began a local push for bilingual safety messages on Quebec road signs and English content on provincial department websites. I must say that it is still quite disappointing that not only is there far too little English on road signs as well as in commerce it is quite sad that Ruth, Harold, myself and many others must advocate in the first place for something that is already within the law. Birnbaum stated, “As MNA you need to be present for the constituents each and every day… solving problems, serving the community.” To that end he thanked his two very accessible and effective attachés, Chris and Liz. last year’s economic mission Historic mission to Israel, the first time a Quebec Premier made such a visit. The Premier’s three visits into the riding, including last week for Yom Hashoah and a previous appearance at the CSL Men’s Club. “There’s no tougher place in Quebec for hard questions than from the 600 men of the CSL Men’s Club,” he said to applause, with a nod to past president Sidney Margles who was present. He also referred to PQ leader Jean-Francois Lisée’s “stupid question”, as Leitao called it, last week on Yom Hashoah. Lisée questioned why Birnbaum should have more rights than Lisée is being allowed to wear a kippa in the assembly while Lisée was singled out for wearing a political symbol in his PQ lapel pin, something not permitted by assembly rules. A political three-party free for all ensued for several days that doesn’t look like it will be over soon as the “identity” question boils over, yet again. Birnbaum called the Liberals, “Inclusive, compassionate and proudly Canadian.” While some may call that an exaggeration, Birnbaum is quite convinced, to be sure. The evening opened with Hampstead Mayor William Steinberg welcoming everyone to his town and throwing his full support behind the candidate. 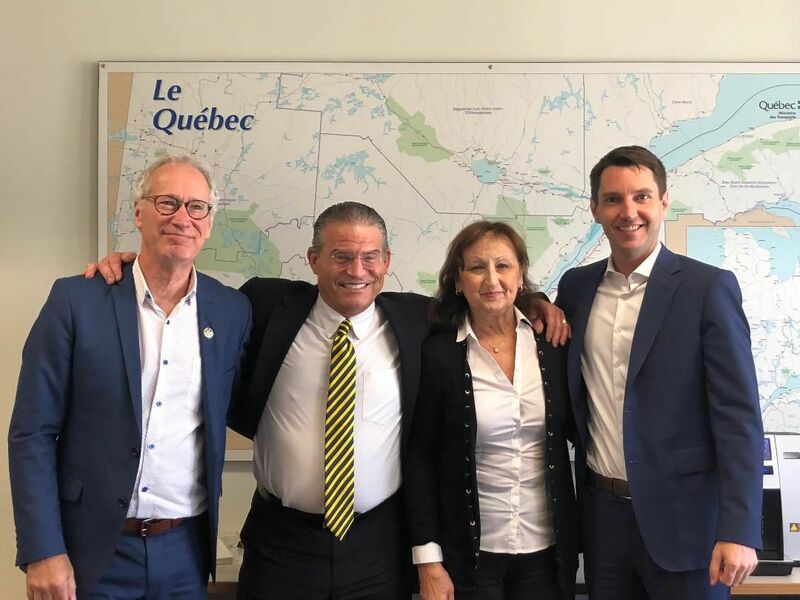 CSL Mayor Mitchell Brownstein was close-by in showing his ongoing support for the MNA, along with Councillors Mike Cohen, Ruth Kovac, Steven Erdelyi and Dida Berku as well as myself and Allan Levine, as former CSL Councillors. Veteran Montreal Councillor Marvin Rotrand was also on hand as was former MNA Judge Herbert Marx and many community leaders. It was clear from this friendly crowd that although D’Arcy McGee doesn’t tend to be a nail-biter in provincial elections they were plenty pleased to have David Birnbaum selected as the local superstar. Thank you to Police Station 9 officers Marie-Christine Norbert, Vincent Deangelis, and more, for educating and reaching out to our residents at the recent Senior Safety Day at the Cavendish Mall. “Your visibility instills confidence and the little gifts are valued and useful,” said CSL Councillor Ruth Kovac who visited the kiosk. Ruth and I have worked on every major (and most minor) safety campaigns since we began volunteering at the CSL Emergency Measures Organization in the early 1980s. Thanks to our first class security programs CSL remains the safest place on the Island of Montreal. We need to be vigilant, always looking to improve and expand these services to ensure we stay in this position and that just what Ruth and I speak out on throughout the year. Celebrating Canada Day 2017 with our local police officers. Thank you to these fine officers for their vigilance in CSL. Newly-renovated Pierre Elliott Trudeau Park is home to Côte Saint-Luc’s celebration of the 150th anniversary of Canada on July 1, as the city honours the Canadian general who saved tens of thousands people, unveils a one-of-a-kind wildlife sculpture garden, and plays host to thousands of residents and visitors. “Ten life-size bronze sculptures of wildlife animals were donated to the city by Canadian artist Shalom Bloom, who lives in Côte Saint-Luc,” Councillor Ruth Kovac said. Canada Day staples such as live music, inflatables, a petting zoo, a pony carousel, a caricaturist, a photo booth, and food trucks will be open from 4pm onwards. The masters of ceremony for the event will be Dan Laxer and Laurie Betito of CJAD 800. The event co-chairs are Councillors Kovac and and Nashen. In the event of rain, the unveiling of the Human Rights Walkway plaque will take place at the Aquatic and Community Centre, following the 5pm Canadian citizenship ceremony. Activities will take place under the roof of the Confederation Annex at Pierre Trudeau Park. The fireworks will be postponed until July 2 at 9:45pm. The Shalom Bloom Sculpture Garden unveiling will be moved to July 13 at 6:30pm. The schedule is at http://www.cotesaintluc.org/canadaday2017.